Artist’s depiction of the Serengeti food web with normal AM (left) and a hypothetical food web without nutrient inputs from these important symbioses (right). Illustration by Victor Leshyk. The complex Serengeti ecosystem, which spans 12,000 square miles extending from northern Tanzania into southwestern Kenya, is home to millions of animals, including 70 species of large mammals. It is a hotspot for mammal diversity—including herbivores such as wildebeest, zebra and gazelles that graze on grasses and trees, as well as lions, crocodiles, leopards and hyenas that survive by preying on the grazing herbivores. A new study published in the Journal of Ecology by a team of Northern Arizona University researchers shows the food web supporting this remarkable variety of wildlife would appear very different without the nutrients supplied by arbuscular mycorrhizal (AM) fungi. The interdisciplinary study, authored by graduate students in NAU’s School of Earth Sciences and Environmental Sustainability—Bo Stevens, Jeffrey Propster, Andrew Abraham and Chase Ridenour—along with assistant professor of informatics, computing, and cyber systems Christopher Doughty and Regents’ Professor of Earth Sciences and Environmental Sustainability Nancy Johnson, quantifies the importance of AM fungi in the soil of the Serengeti National Park in Tanzania. AM fungi, a type of mycorrhizal fungi, penetrate the roots of grasses and other plants native to the Serengeti. Considered natural biofertilizers, AM fungi provide their host plants with water, nutrients and pathogen protection in exchange for photosynthesis. The symbiotic relationship between AM fungi and plants, which has evolved for millions of years, is critical for the uptake of essential plant nutrients such as phosphorus. In turn, the nutritional quality of the plains’ grasses and trees influences the biomass of the herbivores and their predators. 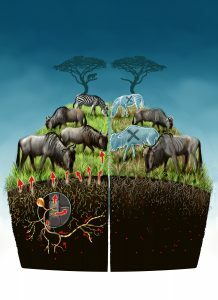 By creating an ecosystem simulation that enabled the researchers to measure the biomass of AM fungi across a natural soil fertility gradient and estimate the contribution of mycorrhizal symbioses to the biomass of all plants and animals in the Serengeti, the researchers were able to estimate the animal biomass that results from phosphorus supplied to plants through AM fungi. This study shows the contribution of mycorrhizal symbioses to the growth and nutritional quality of grasses cascades through the biomass of large grazing mammals and their predators. Although AM fungi amount to less than 1 percent of the overall living biomass in the Serengeti, their predicted nutrient inputs into the food web doubled animal biomass.